Those of you familiar with Camden's club scene may already be in the loop about one of London's most exciting new rock 'n' roll club nights: JUBILEE which takes place every Friday night at Camden Barfly, 10.30pm - 3am. For the first time ever the JUBILEE CLUB tour will hit the road, featuring three of Britain's best new bands. 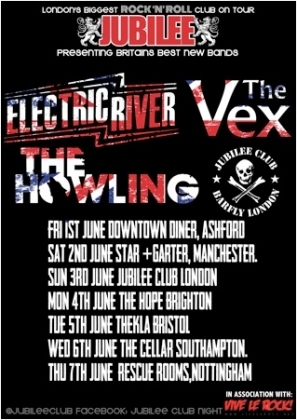 The Vex, Electric River and The Howling have all graced the Jubilee stage over the last few months and they will now be appearing at venues around the UK during a seven date tour. THE VEX have never played a gig where they haven't seen the sunrise the following day, they usually pack out an unwilling friends garden with everyone from the gig and sit and watch together, they play fast and are unforgiving. "We've been honing our pranks in preparation. you can never have enough tabasco. The Howling and Electric River seem like good bands to go away with"
Influenced by Star- Club-era Beatles, The Who, The Clash, the Pistols and The Libertines, the quartet distill sixdecades of musical history into swaggering, sussed, Stanley knife-sharp rock 'n' roll anthems conveying all the energy, vibrancy and vitality of the nation's capital. 21st century urban soul music for a jilted but not yet jaded generation, raw, impassioned, feral and louder than life. “The Howling have packed every Jubilee night they've played in London. It's time to take it on the road. There's some very cool people in this country who like the right music but don't like tall buildings. We want to play to them.” said the band.